This is a case study to show how risk and challenging play in schools has a positive affect on children's learning and development. 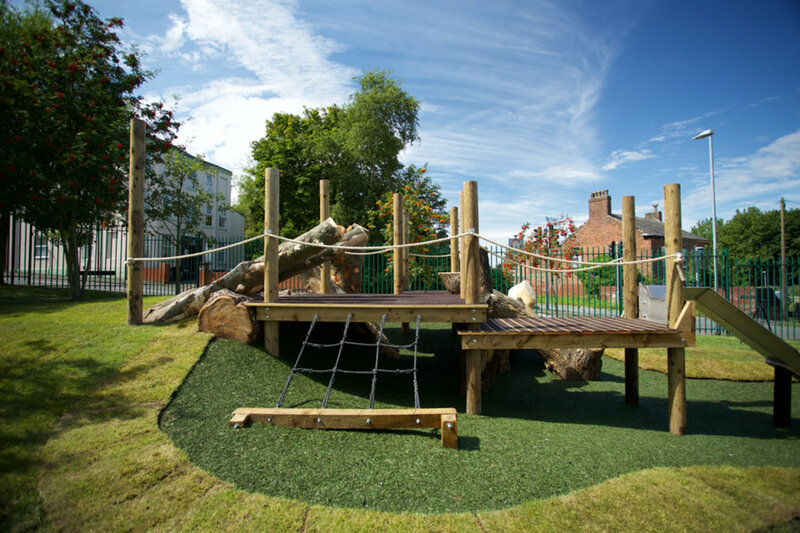 At Great Grounds we believe that play outside the classroom in an interesting and challenging environment provides essential learning opportunities for children. Play, in its widest sense, can contribute to children’s quality of life and to their physical, cognitive, social and emotional well-being. Play and learning are understood to be inextricably linked and in the right environment, children’s cognitive, social and physical abilities are developed through making choices, generating decisions, negotiating, using ideas and imagination whilst exhibiting motivation and perseverance. There is no better place for children to express and learn than in the outdoors, worlds often not accessible in their home lives. We believe that even simple structures can bring to life a child’s imagination and their instinct to explore, climb and much more. Challenging play can be described as a time where children take risks in their play and challenge their own abilities. Children thrive when exposed to manageable quantities of fear and practice keeping their heads and behaving adaptively while experiencing that fear. They learn that they can manage their fear and overcome it. Knight (2006, DES) suggests ‘In a challenging environment, children will be able to test their abilities, learn from their mistakes and stretch themselves further to develop their physical and mental skills’. Great Grounds have risk and challenge at the heart of our ethos and try to incorporate manageable risk in all of our designs and installations. Risk and challenge has been a proven method of integral development for children in places like Berlin and Nordic schools where their schools and parks include great heights, high speed, playing with ‘dangerous’ tools, playing near ‘hazardous’ elements such as fire and water. 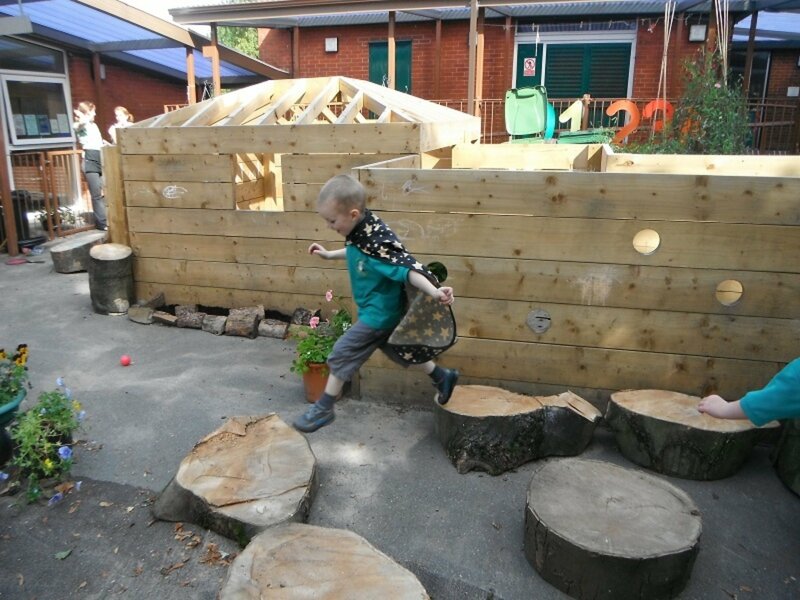 They also develop areas where rough and tumble play is encouraged creating a setting where the children can get lost in their own imagination. Although risk and challenge in play benefits children, in the UK there is still a wide spread mindset of avoidance when forming opinions on challenging play and all too often, a risk adverse culture prevails. Schools with a risk adverse mindset can deny children the opportunity for learning and development in play, replacing it with the fear of what might go wrong. For some children this can create risks itself with children making the wrong decisions as a result of insufficient experience of managing risk. An example of this would be a child who has always had their hand held when crossing the road (without being taught the potential dangers) crossing a road without looking when the hand was not held! Cautious children have their insecurities reinforced and are often not able to learn through experimentation. Confident children can actually become unable to handle hazards as a result of an over-protected environment, by not being given the opportunity to manage risks that they are potentially exposed to. Generally, during our first meeting with the school leadership team we assess the schools position and views on risk and challenge. If the school is risk adverse we encourage school leaders to explore new opportunities, often providing case studies and other supporting information demonstrating why children need to learn how to manage risk and ways of adding risk to the outdoor environment with the target to reduce serious accidents by creating a setting where children can learn about their own abilities and the consequences of their actions. Following the installation of many projects we commission a RoSPA safety inspection. They undertake an assessment of the quality of workmanship and provide a specific risk assessment. Risk levels often can be varied and adapted to the year groups that are using the equipment, for example introducing or removing safety netting, with the RoSPA inspector providing an assessment for both options. 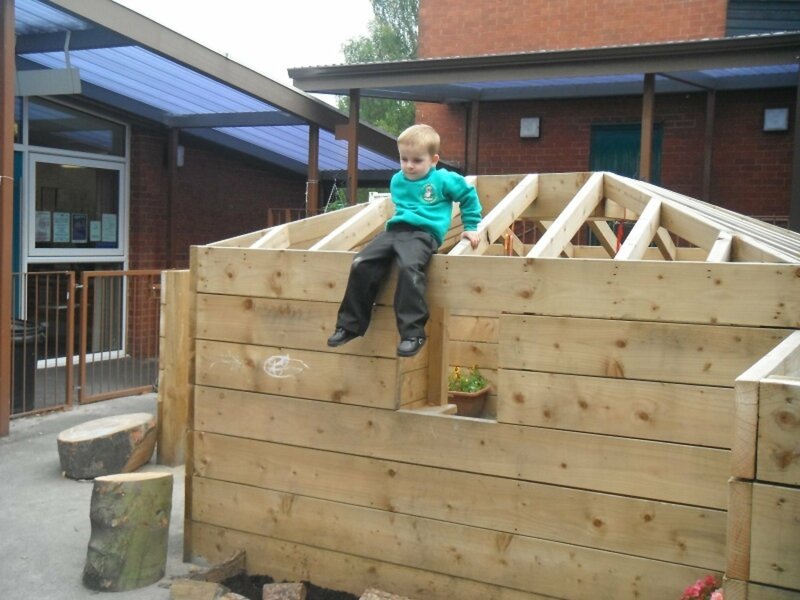 At a recent project at St Edwards Catholic Primary School in Runcorn we constructed a timber climbing feature which can be set up as either a medium of low risk feature, giving the school flexibility of use with only simple changes that can be undertake by the school. Risk and challenge in the outdoor environment is without doubt beneficial for children’s social, cognitive and physical development. 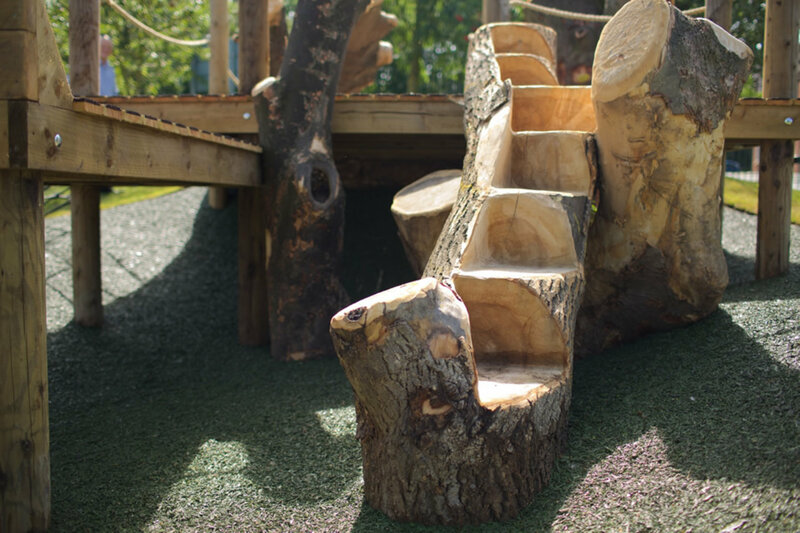 We at Great Grounds are leading the way in designing and installing bespoke outdoor environments that actively encourage children to take managed risks, learning to assess potential danger in their surroundings and gaining a lifelong skill whilst having fun.